Ever been fascinated by the art showcased in galleries, impressed by a certain architecture or sculptures, well there are people out there who work to get it made or make it themselves. A career in Fine Arts is one which is the underdog of this era especially in India. 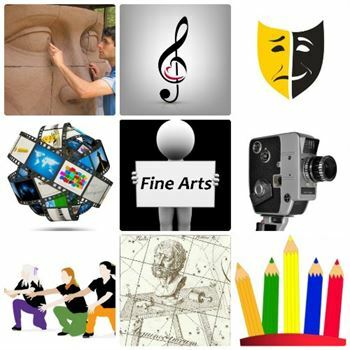 A career in Fine Arts would include subjects such as designing, sculpting, drama, music, pottery, interior designing, painting and much more similar subjects. It is course which deals with art as a form, and focuses on creating objects on the basis of concepts and ideas, keeping in mind the aesthetics of that object rather than the utility. Although today people have woken up to the concept of arts and its importance but we are still far away from how it is in the other parts of the world. Although with its acceptance, this conventional art form has brought with itself the notion of encashing the opportunities and making it profitable for commercial purposes. There has been increase in this industry over the past few years, and today’s youth has started opting for the field on realizing the popularity, esteem and the kind of pay packages involved. In order to apply for Bachelor’s Courses in Fine Arts, the candidate must have passed their higher secondary education (10+2). The general course duration for UG courses in Finer Arts last for three to four years. For someone who is interested in applying for Master’s Courses in Fine Arts, needs to have passed their graduation in Fine Arts. The PG courses last for two years. The field focuses broadly on painting, sculpting, applied art, graphic design and mural design. You must have a creative streak and be able to learn and master various media to express your art. Colleges usually organize annual art and design exhibitions that get a critical review from the public. Graduates from this field get the choice of joining software companies, publishing houses, art studios, freelancing, etc. There is a majority of people who are self employed in this field and this enables them to work on pieces and work of their choice. One can start working as a critic or an art specialist as well but this option would require some previous experience in the field and some hands on job which exposes you to art so that you later have the option of knowing what you are criticizing or commenting on. There are many artisans that who freelance and make their living on the basis of the work they do. However you should keep in mind, that while doing this you will not only create but also promote on your own and this also brings along with itself the fear of an irregular income. On the contrary of your work is great then there are great rewards for the work that you do, but it will be a risk which you will have to take to find out. You can join creative departments of advertising agencies, magazines, newspapers in the publishing industry or the textile industry. Electronic media, films and theatre are other options. The salary is varied, and also depends on your talent. You can also be an art historian, art dealer, art therapist or art educator. Unfortunately, few artists have the luxury of becoming full-time painters or sculptors. A fresher in this industry can start his career with somewhere Rs 10,000 per month that also depending on the basis of your talent. People who work with magazines, publishing house or advertising agencies can also expect to earn Rs 15,000 to 25,000 a month.